Our mission is to enhance the well-being of individuals in our community through the physical, cognitive, and emotional benefits of therapeutic horsemanship. At Renew, each rider has the opportunity to go beyond their disability, inability, fear, or reality. 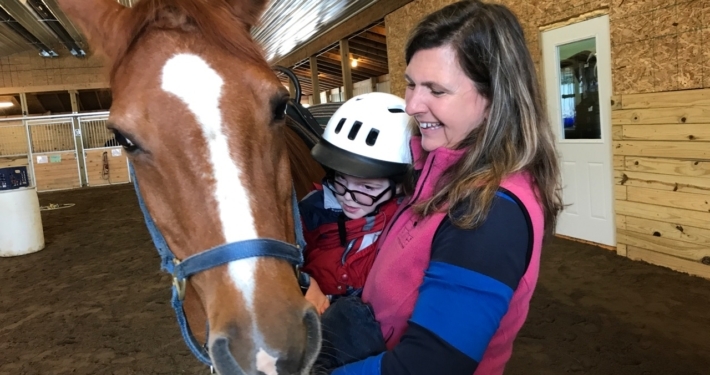 We encourage and support dreams by offering therapeutic horsemanship activities to fulfill our mission, striving to help riders develop their maximum potential in a caring and fun environment that empowers the rider in ways different from traditional therapy. Renew Therapeutic Riding Center is a 501(c)(3) non-profit organization that is focused on improving the lives of all its riders. We are a Premier Accredited Center with PATH International, the only accredited therapeutic riding center in West Michigan. Every donation makes a difference. By contributing to Renew, you are directly impacting the lives of our riders, our horses, and our volunteers. Renew riders often experience higher levels of self esteem, improved ability and focus, enhanced emotional regulation, sharpened communication skills, increased physical strength, and improved balance. By supporting Renew, you are supporting our community.